Amazing, are you going to be able to exceed the previous part limit with this and be able to equip everything if you wanted? Huh, really? Ok. I'll describe it step by step. As usual, I use emulator ePSXe 2.0.5. 1. Disable status change for MISSING, MISSING, and DEAD. Since I know this is actually disable gaining lives from rescued reploids. Then, I start playing the game by activating Ultimate armor code. Pause and check my rank. Stated Rank D.
At the same time, change button configuration to my preference. Beat intro stage and skip Isoc's speech scene. Go to Amazon Area by choosing Ultimate armor. Pause again and of course my rank still D.
Collect all items and save all 16 Reploids by compulsory dying once. Beat Commander Yammark by collecting 255/260 souls. Alia will report you're now Hunter rank C.
Skip Gate and Isoc conversation scene. Go to Amazon Area again. Pause and check my rank. It's still D.
Also, you ask about the Nightmare effects whether it is needed to save injured reploids? The ice wall lead to hidden stage will only break if you previously visited Magma Area. You can access the hidden stage with just Blade, and Zero. If you equipped Jumper, and Speedster, Ultimate can also make it to the hidden area. If you previously visited Recycle Lab, the iron moving block will appear in this stage. Every character except Shadow with Metal Anchor/Rakukojin weapon can access to the hidden area. If you equipped Jumper, and Hyper Dash, every character can make it to the hidden area. If you previously visited Central Museum, the blue, red, and black cubes will appear. I'm not sure whether the black cube may help you reach the hidden area without any equipment. For limited parts, you can't select more than one even if the main table is set above 1. For regular parts, you "can", but obviously the menu doesn't adapt to this, it gets a bit glitchy. I'm not even sure you actually get the effect of everything you select. So, at least on the patcher, the options will be limited to the normal range of 1-4 for regular parts and 1 for limited parts. The idea is to be able to set more parts with lower ranks. But I'll update the spreadsheet with all the new stuff for anyone who wants to experiment more. Thanks. I'll test following those steps next time. I've only tried this option by editing the game directly so there's a chance your problem may come from an error on the patcher I posted earlier. Thanks x2! I only vaguely remembered the Nightmare effects being used to reach or block certain areas. So, only the Northpole Area one is completely unreachable without the aid of the Nightmare effects? If I can isolate this one change in the stage (it's probably a separate check than the one that actually causes the effect), I'll try to make it so the path is always open as a workaround. For the others that can be accessed using certain parts or armor, I think I'll just leave them like that. Did someone say DISABLE NIGHTMARE EFFECTS? (Though I didn't know some nightmare effects (Such as Blaze Heatnix's for Blizzard Wolfang) were necessary for upgrades. The Metal Shark Prayer visit demand and Ground Scravich visit demand can be avoided, however. As the other guy said before, Blaze Heatnix's secret area can be accessed with the Blade Armor or a double jump. For Metal Shark Prayer, only Hyper Dash is enough. I did that myself. By the skin of the teeth, but I did. I sent the report directly to you before, but why not share it here. The game has been running perfectly smoothly so far. As for bugs, Alia's scene of explaining the Nightmare Virus is replaying every time X exits a stage after attaining UH. Thanks for reporting back, and thanks for the confirmation on those areas! Sounds like the ice stage would be the only problematic one. I haven't looked at the Alia scene issue yet, I've been busy with the new options, but it's something that I definitely want to get fixed. It would be weird to not be able to modify it reliably and have it stuck at the regular 3000 souls requirement. I just need to figure out what's stopping it from playing more than once in the regular game, and why isn't it working after the souls trigger is changed. First: it checks if you have the final stages unlocked. If they are, the scene is skipped. Then: it checks for number of souls requirement. If it's not met, the scene is skipped. There's no actual flag for having seen the scene already, but since the original game set the souls requirement the same as the requirement to unlock the last stages, it's only shown once. I've also isolated the blocked walls from the ice stage. It'll be patched to be always open if the option to disable the fireball Nightmare effect is selected. That's all in terms of fixes, for now. All that's left is to write the new options into the patcher and make them all work together and in any combination. I hope I can get it done by the end of the week. This is the patcher (and set of features) I'm gonna be settling in for now. Great job, Acediez! One thing, the game crashes during the Mission Report if you play on a PSP. Not sure if there's anything that can be done. What options are you patching the game with? If it's a problem I can reproduce on Mednafen PSX or hardware (I'm currently testing on a PS2), I'll take it as a bug that needs to be fixed. If it only happens in PSP, I don't know how to look for the cause. This was a problem from the first patcher you released. But the modified ISO that you originally shared worked fine. But thankfully, I haven't had any issues running the game on emulators. I did notice that the Ranks are stuck at D when you have X & Zero share Rank & Souls. That was an issue with the earlier patcher you linked. tried 4b, and removed nightmare effects, shared hp/weapons, shared rank and normal parts available from the start. When reaching mission results on my psp, the game hangs(not crashes). It also hangs at the mission results even when starting from an old save from a previous version. Will try without tied rank and/or nightmare effects. Thanks for confirming the issue. If it happens every time, it most likely related to the shared Rank options. I think I spotted a potentially problematic line on that modification. I'm gonna take a look at it. The only other modification affecting the mission report screen are the shared Life/Energy upgrades. If you're willing to test again without the shared Rank option, please see if getting a Life Up/Energy Up with shared Life and Energy upgrades works or not. I'm using psx2psp. I tried builds with nightmare effects only & shared rank only and it only hangs when I used shared rank. I've had no problems with getting a life up & weapon up with shared life/energy. Ok, tried it in my PSP, and I got the same problem. It was caused by a badly placed jump to the new code. I'm more surprised that it was working fine on PS2 and anywhere else. I moved things around and now it really works everywhere, PSP included. Whoa, seems like I missing some new stuffs. Watching World Cup too much. Guess I will just skip tweak patcher v04a and v04b. Will try out v04c and feedback later. Anyway, I'm kind of curious of 2 things. 1) Can you explain what do error_recalc does and how to apply this program? I still don't understand it after reading the notepad. 2) You said you're currently testing it on PS2. Does that mean you use POPStarter and change the bin and cue file to VCD format using the CUE2POPS? I'm not gonna be researching new options for awhile, I'm more concerned on completely testing the current version to re-release it on the site, but I'll consider it for later on. I don't even know if those upgrades are even handled as "parts equipped" or some other way. Watching World Cup too much. EDC/ECC sectors of the disc act as a checksum for the data on the whole disc. They're used to "repair" "invalid" sectors on the fly. So, if you don't update those sectors, some of the modified bytes will revert to the original state when loaded, breaking the modifications, causing freezes, or even preventing the game from booting at all. ePSXe and no$psx ignore them, so if you're just gonna play there, you don't need to recalculate them. But consoles, and more accurate emulators use it. It's mandatory to play on hardware or even Mednafen PSX. Nope. I have a modchip, so I just burn a disc and play natively. I don't know much about POPstarter, but I'm pretty sure it doesn't count as "playing on console", as it's emulating, and not as accurate/compatible as you'd expect. 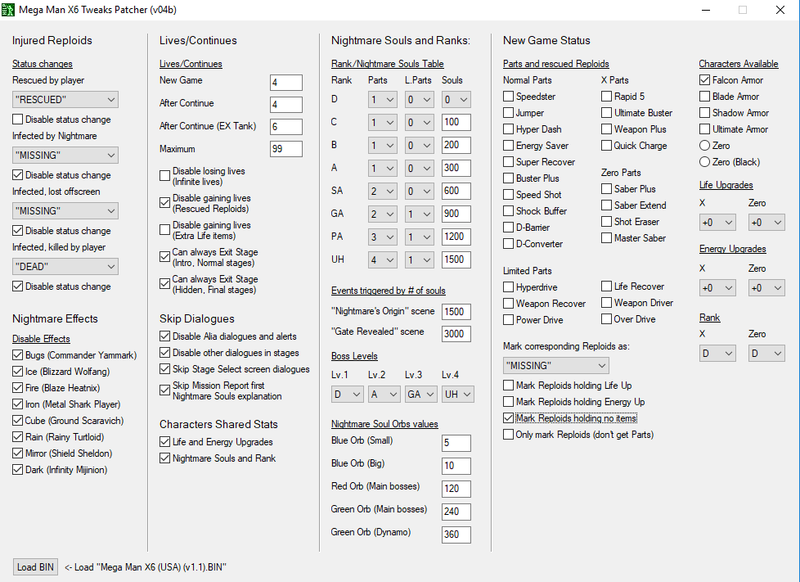 This time, tested some of the Mega Man X6 Tweaks Patcher (v04c) using emulator ePSXe 2.0.5. I only test whatever new and bugs that occured in v03a. Bugs (Commander Yammark) = Disable Nightmare Effects on Blaze Heatnix's and Shield Sheldon's stages. Ice (Blizzard Wolfang) = Disable Nightmare Effects on Metal Shark Player's stage. Fire (Blaze Heatnix) = Disable Nightmare Effects on Blizzard Wolfang's (ice wall still break and enable secret area) and Infinity Mijinion's stages. Iron (Metal Shark Player) = Disable Nightmare Effects on Blaze Heatnix's, Ground Scaravich's and Infinity Mijinion's stages. Cube (Ground Scaravich) = Disable Nightmare Effects on Metal Shark Player's and Shield Sheldon's stages. Rain (Rainy Turtloid) = Disable Nightmare Effects on Commander Yammark's and Ground Scaravich's stages. Mirror (Shield Sheldon) = Disable Nightmare Effects on Blizzard Wolfang's and Rainy Turtloid's stages. Dark (Infinity Mijinion) = Disable Nightmare Effects on Commander Yammark's and Rainy Turtloid's stages. I only tested it once each. Yeah, should be working fine. However, I forgot to test if disable 1 Nightmare Effects may disable other Nightmare Effects. Will try it again later if got time. Both Life and Energy Upgrades, and Nightmare Souls and Rank are working perfectly now. Only tested the normal parts. I don't have enough time. Will feed back again later. Jumper = Reploids rescued (Dante from Northpole Area) is correct but gets Jumper and Hyper Dash. Speed Shot = Reploids rescued (Tekk from Weapon Center) is correct but gets Buster Plus and Speed Shot. Shock Buffer = Reploids rescued (Toshi from Recycle Lab) is correct but gets Buster Plus and Shock Buffer. D.Barrier = Reploids rescued (Kenz from Laser Institute) is correct but gets Buster Plus and D.Barrier. D-Converter = Reploids rescued (Paralla from Weapon Center) is correct but gets Buster Plus and D-Converter. However, if you tick all the normal parts, you get all the 10 normal parts plus the correct 10 Reploids rescued. By using this patcher, you'll permanently disable from getting Ultimate if you use the left, left, left, right code. You can only get to play the intro stage as Ultimate. Same goes to Zero (Black). Cannot be activated with L1, L1, L1, R2 code. However, you might still get Zero (Black) by beating Nightmare Zero lv4. You will still keep Falcon. After intro stage, Blade/Shadow will be available. No more armor parts capsules for the specific characters. The game still starts as Falcon but you'll be able to keep Ultimate after intro stage. After the intro stage, Zero/Zero (Black) will be available. However, you'll skip the optional boss fight 1 (Nightmare Zero) and move on straight to optional boss fight 2 (High Max). All are working fine as stated. However, if Characters Shared Stats was activated, and X and Zero was having different value, the patcher will always follows X's stats. Also, the nightmare souls you have will be the value you set for Rank A. In this case, if you did not altered the Nightmare Souls and Ranks, Rank A = 500.